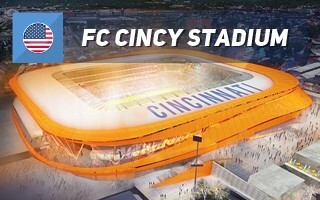 As you surely know, next year FC Cincinnati is joining MLS. The team has already proved very popular as a USL (2nd league) side, topping the list of attendances for three years in a row! FC Cincy began with a regular following of nearly 17,500 and this year they're already in the 25,000+ range. It's thus no wonder that their new stadium scheme is followed closely by media nationwide. The design is yet to see some changes, though they should not be fundamental. The full concept plan will be presented to the City of Cincinnati on Nov. 19, 2018 for technical review. The club’s formal submission of its schematic design, the second stage of design which will include further adjustments following a technical review, will be made to the city on Dec. 3, 2018. The design development stage will continue into the first quarter of 2019 before a series of final construction documents are submitted ahead of the start of construction on the stadium next spring. The stadium is scheduled to open in March 2021.